Discussion in 'Honorbuddy Store Profiles' started by Aion, Sep 2, 2015. BUY Now for 14.99 Euro ONLY! This BuddyStore Product is Bundle of several Questing Profile Packs, aiding to the progress of Draenor Pathfinder Meta Achievement, Unlocking the Draenor Flying within the whole Battle.net account! 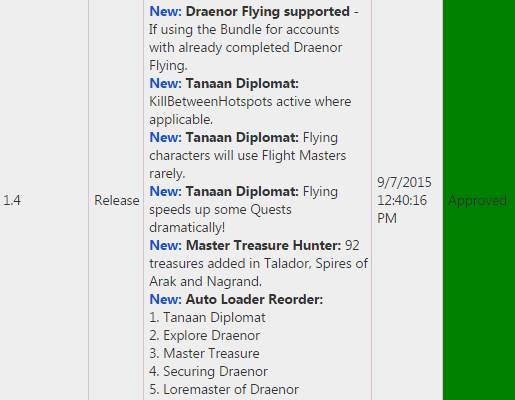 Draenor Flying includes 4 other Buddy Store Products, as described in its Buddy Store page. 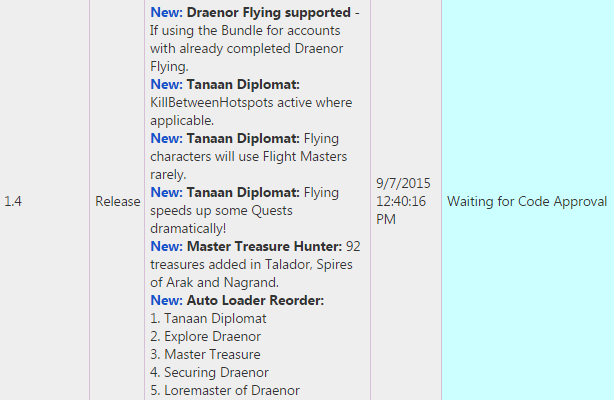 1-click Project to Automate earning of the popular Draenor Pathfinder Meta Achievement, Unlocking Draenor Flying on 2th of Sept. with Patch 6.2.2. Draenor Flying Auto Loader, supporting all product's profiles in verbose mode - Meta achievements, already unlocked on the battle.net are detected and skipped! Explore Draenor - Single profile to explore all Draenor, in verbose mode again - Already explored zones/subzones are detected and skipped. All the Assault and Missive Daily Quests to unlock it are included, with dedicated Auto Loader. As of 20.08.2015, Tanaan Jungle zone is almost 100% meshed, so random stuck or path issues are very unlikely, but still possible. Nice work. I think all products are already ready, there will be a new release HB. The longest process is reputation if farm Daily Quests will take about a week. Nice work. I think all products are already ready, there will be a new release HB. The longest process is reputation if to farm Daily Quests will take about a week. Since it is fresh product, even after it is Bundle of mixed new and already available products, we need to wait up to 7 day for approval. Meanwhile calculating the reputation data and will update the Timeline chapter with realistic data howmany days are required for unlocking the Flying. Can't wait to hear results. Hello I'm speculating on the whole bundle! Draenor Flying pack. When can I buy the product at the store? When it pass the BuddyStore tests and gets approved! For new products, this usually takes up to 7 days. how can i get a trial test for the beta? It keeps getting stuck at "moving to hunting ground waypoint: 'hunting ground center' "
EDIT: it is trying to move to an iron box, and it is stuck at "Gordal fortress"
Ok I have bought this product yesterday. Is this normal my character has accepted quest in Tanaandschungel everything well, only the autoloader completes only half of the quests and then he makes constantly bonus quest there. Ps: I thought the profiles makes gradually Achievements finished? Would you provide a log, to check what could have made it stuck for you. Thanks for the logs provided, your rogue did pretty nice rush in less than 3 hours! While your garrison was still not upgraded to Tier 3, you have noticed it, upgraded, then the bot rushed thru Unlocking Tanaan, then unlocking the Dailies there, and ran thru all of them, up to Temple of Sha'naar in 2:50 hours! On your question - You have ran up to the last bonus area - Temple of Sha'naar. When you restart the profile, the bot will finish it, then complete the remaining demons for 20demons quest and delivery all. Meanwhile, since its your first day in Tanaan, the first 6.2 Garrison Campaign should be popped up, and the bot should complete it too - it is important towards the Tanaan Diplomat too, because every campaign give 1000-1400 reputation too. The reputation-giving quests are the Oil Daily, Arrakoa Daily, the Random Daily and all the 2 random dailies after Oil is delivered. So the profile is coded to complete all the bonus objectives, while working on the side quests completion. The extra time, vs target completing just these bonus objectives with quests in them is not more than 2 bonus objectives out of 6x. P.S. When you finish your daily Tanaan run, the bot will continue with the 1-time Flying achievements, like Explore Draenor, Master Treasure and Securing Draenor. I just downloaded this profile and I keep getting fatal errors. It is trying to fly around when I don't have flying, which is why I have profile. I am horde if that matters.